In winter, the colours of Cornwall appear to be rather muted greys, white and yellow. But enchanting all the same. Yesterday I posted some photos from the harbour in St Ives, one of which was looking back up at the town which is built on the hillside. Some of you may have noticed an unusual domed structure in front of the upper row of terraced houses (right-hand side). Well this image is from the location of that structure which appears to be an observation tower on a studio on Barnoon Terrace where the houses and flats have an amazing view over the harbour and St Ives Bay towards Godrevy Lighthouse and the north Cornish coastline. 4-5 bedroomed houses here sell for well over half a million pounds and flats from £175k. Oh, if only I could have bought something before the millennium when a flat could cost as little as £30k. Well you live in an ideal spot, close to everything you need so no need to move. And if you did you’d have to spend the same amount to get a decent property I imagine. Not tempted to return to New Zealand? Being a 2 story place the only problem could be the stairs as time goes by. But we could always move back down to the granny flat. I’ve grown to really love Australia so don’t think I would go back to NZ, much as I love it, but who knows what the future will bring. Hard to take a bad view of St Ives. 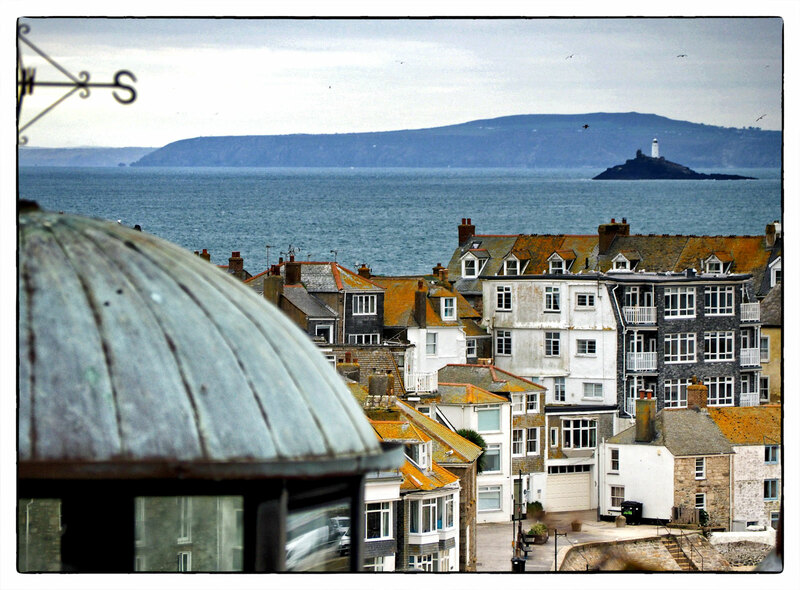 St Ives is a lovely place and yes the views are great wherever you turn. I’m surprised you can buy even a small flat for £175K. Well that was the price of the last sale. It might be much more I suppose.